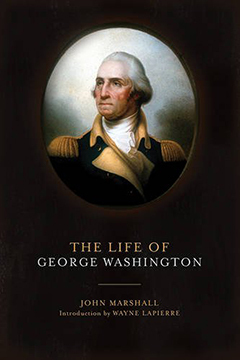 America’s first president has captivated our interest for more than two centuries, but no biographer of George Washington knew him with the authenticity, intimacy, and depth of understanding as John Marshall exhibited in his book THE LIFE OF GEORGE WASHINGTON. This biography was begun in 1799 following Washington’s death, when chief justice Marshall was granted by Washington’s surviving family full access to all of his records, papers, and personal archives. The result is a story not only of George Washington, but also of America’s founding. Marshall covers every major event in Washington’s personal life and in his public role as a founding father, including his childhood, his early career, his resignation as colonel, his marriage to Martha, the invasion of Canada, early negotiations with the British, the crossing of the Delaware, the state of Washington’s army during the Revolution, the treason of Benedict Arnold, the official announcement of the election of Washington as president, meetings of Congress, a threatened war with France toward the end of his life, his death, and his character. Marshall’s biography of George Washington was first published in Philadelphia in five volumes, between 1804 and 1807, and today, copies of this first edition are among the rarest and most expensive of antiquarian books. This edition is an exact facsimile of the one-volume edition published in 1857, also a very rare book, which was specially edited and abridged for a general audience by John Marshall himself. A great biography of a tall and mysterious man who was considered “bullet proof” in his early days as an officer in the British Army and was probably the greatest president that America has ever had. Published at $14.95, our price only $12.95.